Bowling Green, KY – Western Kentucky University (WKU) graduate research assistant, Alyssa Olenick, was recently awarded with a fully funded doctoral student assistantship from Vanderbilt University’s (VU) Interdisciplinary Graduate Program in Biomedical Sciences. Olenick, who graduated from Lock Haven University of Pennsylvania, is a second year graduate research assistant, working in the WKU School of Kinesiology, Recreation and Sport (KRS) in the College of Health and Human Services (CHHS), under the mentorship of WKU Assistant Professor Dr. Jill Maples. The VU Interdisciplinary Graduate Program in Biomedical Sciences, housed within the VU School of Medicine, is ranked 15th in the nation for medical research and 10th in the nation for funding from the National Institute of Health Funding (NIH). 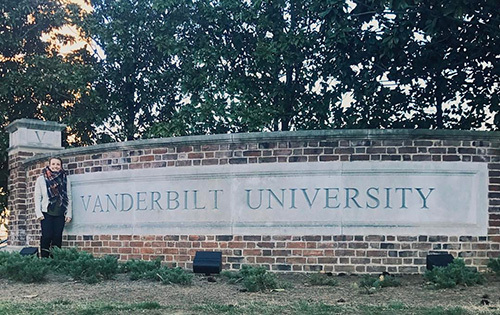 Vanderbilt University is a premier research facility that ranks among the top institutions in the country. Olenick who is currently conducting thesis research at WKU’s Graduate School on metabolic flexibility in women after a single high fat meal, plans on further pursuing research pertaining to diabetes and obesity.